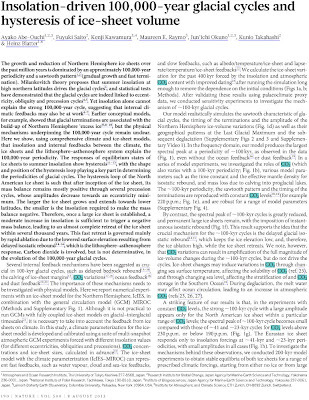 A paper published today in Nature finds that ice ages in the Northern Hemisphere can be explained by Milankovitch cycles and the unique geography of the North American ice sheet, finding, "the crucial mechanism for the 100,000 year cycles is the delayed glacial isostatic rebound which keeps the ice elevation low, and, therefore, the ice ablation high, while the ice sheet retreats." The authors are able to reproduce the saw-tooth pattern of ice ages using a model that assumes a constant level of atmospheric CO2. 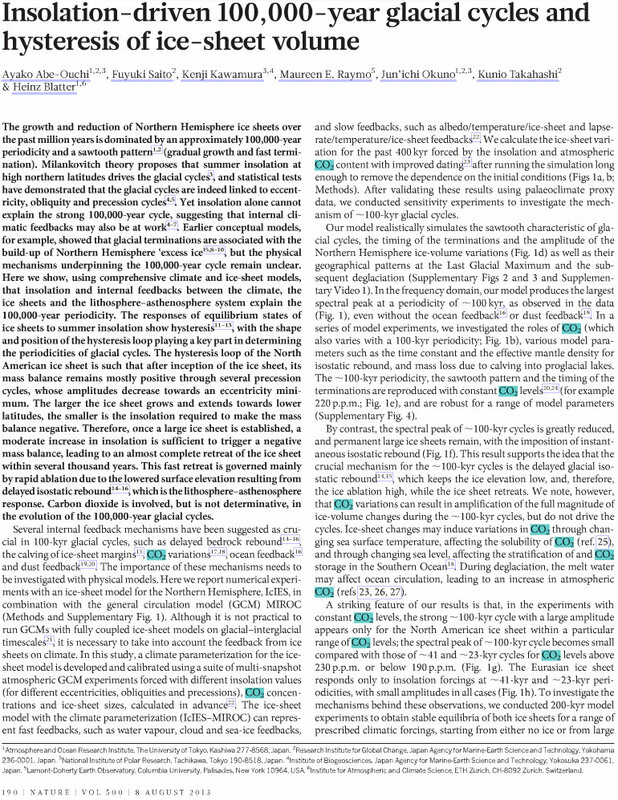 The prior 'consensus' was that Milankovitch cycles and CO2 were the primary drivers of ice age cycles, but this paper finds CO2 played a minor role, stating, "Carbon dioxide is involved, but is not determinative, in the evolution of the 100,000-year glacial cycles." Still unexplained, however, is that ice ages were approximately synchronous between the Northern and Southern hemispheres, even though by Milankovitch theory an increase in solar radiation in the Northern Hemisphere is offset by an equal decrease of solar radiation in the Southern Hemisphere. The 100-kyr periodicity, the sawtooth pattern and the timing of the terminations are reproduced with constant CO2 levels 20,24 (for example 220 p.p.m. ; Fig. 1e), and are robust for a range of model parameters (Supplementary Fig. 4). By contrast, the spectral peak of ,100-kyr cycles is greatly reduced, and permanent large ice sheets remain, with the imposition of instantaneous isostatic rebound (Fig. 1f). 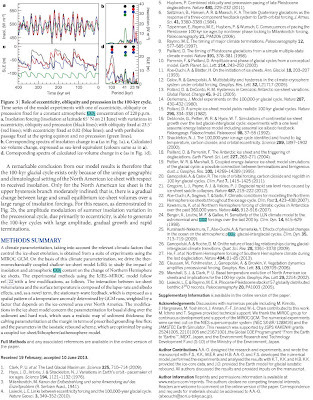 This result supports the idea that the crucial mechanism for the 100-kyr cycles is the delayed glacial isostatic rebound 14,15, which keeps the ice elevation low, and, therefore, the ice ablation high, while the ice sheet retreats. We note, however, that CO2 variations can result in amplification of the full magnitude of ice-volume changes during the 100-kyr cycles, but do not drive the cycles. Ice-sheet changes may induce variations in CO2 through changing sea surface temperature, affecting the solubility of CO2 (ref. 25), and through changing sea level, affecting the stratification of and CO2 storage in the Southern Ocean18. During deglaciation, the melt water may affect ocean circulation, leading to an increase in atmospheric CO2 (refs 23, 26, 27). A remarkable conclusion from our model results is therefore that the 100,000 year glacial cycle exists only because of the unique geographic and climatological setting of the North American ice sheet with respect to received insolation. Only for the North American ice sheet is the upper hysteresis branch moderately inclined; that is, there is a gradual change between large and small equilibrium ice-sheet volumes over a large range of insolation forcings. For this reason, as demonstrated in Fig. 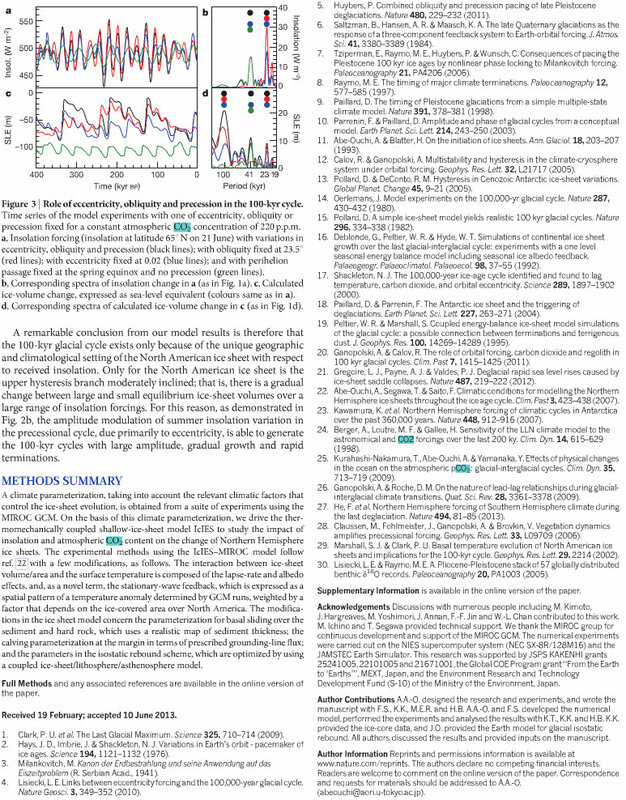 2b, the amplitude modulation of summer insolation variation in the precessional cycle, due primarily to eccentricity, is able to generate the 100-kyr cycles with large amplitude, gradual growth and rapid terminations. The growth and reduction of Northern Hemisphere ice sheets over the past million years is dominated by an approximately 100,000-year periodicity and a sawtooth pattern1, 2 (gradual growth and fast termination). 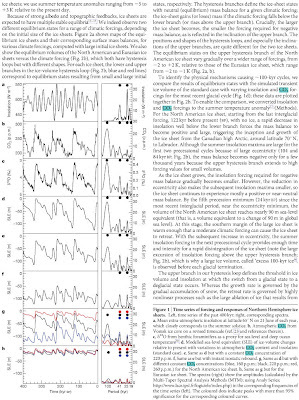 Milankovitch theory proposes that summer insolation at high northern latitudes drives the glacial cycles3, and statistical tests have demonstrated that the glacial cycles are indeed linked to eccentricity, obliquity and precession cycles4, 5. Yet insolation alone cannot explain the strong 100,000-year cycle, suggesting that internal [natural] climatic feedbacks may also be at work4, 5, 6, 7. Earlier conceptual models, for example, showed that glacial terminations are associated with the build-up of Northern Hemisphere ‘excess ice’5, 8, 9, 10, but the physical mechanisms underpinning the 100,000-year cycle remain unclear. Here we show, using comprehensive climate and ice-sheet models, that insolation and internal feedbacks between the climate, the ice sheets and the lithosphere–asthenosphere system explain the 100,000-year periodicity. The responses of equilibrium states of ice sheets to summer insolation show hysteresis11, 12, 13, with the shape and position of the hysteresis loop playing a key part in determining the periodicities of glacial cycles. The hysteresis loop of the North American ice sheet is such that after inception of the ice sheet, its mass balance remains mostly positive through several precession cycles, whose amplitudes decrease towards an eccentricity minimum. The larger the ice sheet grows and extends towards lower latitudes, the smaller is the insolation required to make the mass balance negative. Therefore, once a large ice sheet is established, a moderate increase in insolation is sufficient to trigger a negative mass balance, leading to an almost complete retreat of the ice sheet within several thousand years. This fast retreat is governed mainly by rapid ablation due to the lowered surface elevation resulting from delayed isostatic rebound14, 15, 16, which is the lithosphere–asthenosphere response. Carbon dioxide is involved, but is not determinative, in the evolution of the 100,000-year glacial cycles. Noted above"Still unexplained, however, is that ice ages were approximately synchronous between the Northern and Southern hemispheres, even though by Milankovitch theory an increase in solar radiation in the Northern Hemisphere is offset by an equal decrease of solar radiation in the Southern Hemisphere." Is this true of all three Milankovitch cycles? I can see how it would be true of the tilt and wobble cycles. But I suspect the orbital distance cycle, circular to ellipse transitioning, would affect both north and south similarly. The 100,000yr 'problem' goes way once you correctly integrate longterm effect of insolation difference on oceans. Under-estimating depth and timescale of ocean response to changing solar forcing is part of the AGW rationale. "New paper finds ice ages explained even with constant levels of CO2"
1. Fig 1g black line shows CO2 220 ppm but allowed to vary with out-gassing & in-gassing. 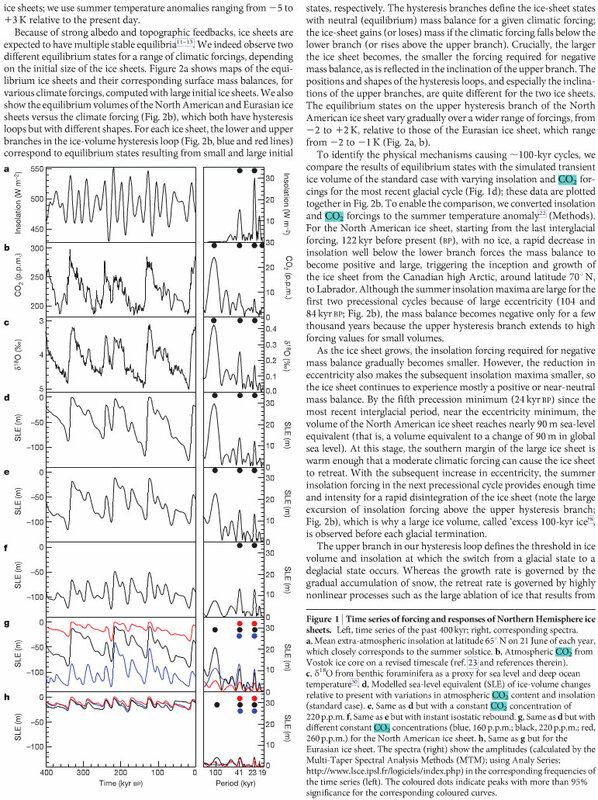 Fig 1e has an almost identical amplitude of the glacial cycles with CO2 held constant. Therefore, the prior 'consensus' that positive-feedbacks from CO2 levels following temperature are necessary to explain the amplitude of glacial cycles is disproven. 2. The modeling assumptions of CO2 radiative forcing made in this paper also suffer from the same assumptions that have caused all 73 IPCC AR5 climate models to exaggerate warming - namely over-sensitivity to CO2. "We note, however, that CO2 variations can result in amplification of the full magnitude of ice-volume changes during the 100-kyr cycles, but do not drive the cycles."